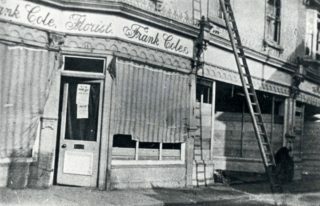 Frank Cole lived with Louise his wife at 8, North Road. Presumably he lived above the shop. On the night of 13th October there was an airship raid on London. It was one of the worst raids of the war with five Zeppelins flying in formation. There was no blackout in Hertford and one of the airships, Zeppelin L16, was presumably off course and mistook the lights of Hertford for Stratford and Est Ham. 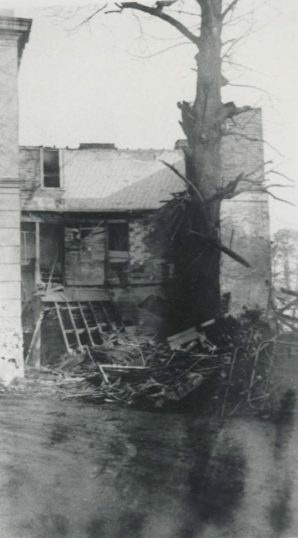 At 10pm the airship dropped a total of 44 bombs leaving a trail of destruction from The Meads across Hartham, the Folly, Bull Plain, the Wash, Mill Bridge, Old Cross, St Andrew Street, North Crescent and finishing near County Hospital. Four men who had been enjoying a drink in Lombard House (Hertford Club) came out to look at this interesting sight. 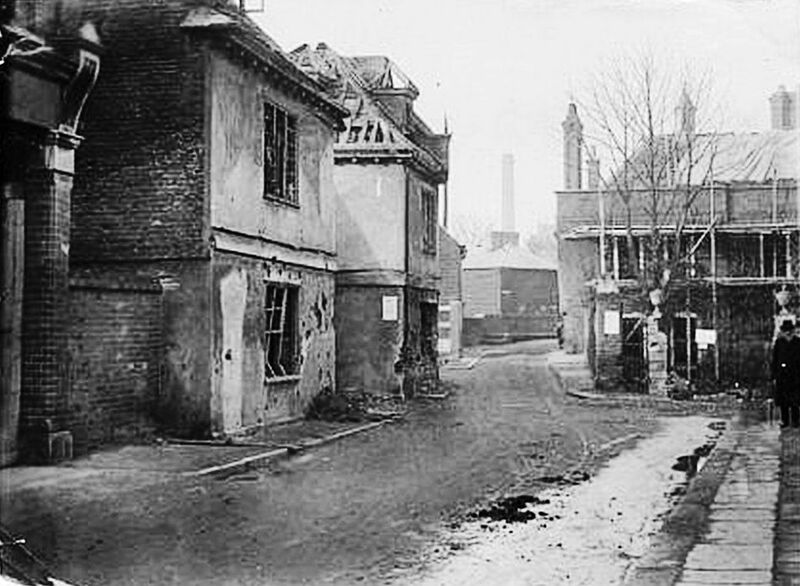 At this point one of the bombs fell on the road outside the club and the four men were killed, They were George Cartledge a draper who ran a shop at 28, Fore Street; John Henry Jevans, Borough Surveyor; J.L. Gregory, organist at All Saints’ Church and E.T. Jolly, a cashier at Barclays Bank, then in Fore Street. Three other men – A.J. Cox (aged 21), A.Hart (51), C Spicer (32) and two children, George S. Game (3) and Charles Waller, (13) also died in the raid. Twenty people were reportedly injured. 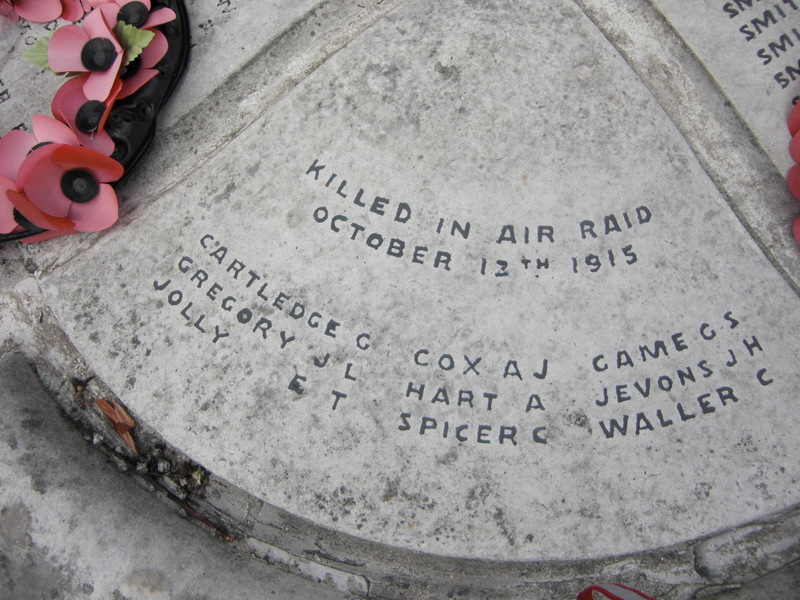 Unusually the names of these people were recorded on the war memorial in Parliament Square. A photograph of the relevant part of the memorial can be seen to the side..
LONDON AND DISTRICT BOMBARDED BY ZEPPELINS. One announcement, dated Thursday, 12.10 a.m. came from the Home Secretary. This talked about a Zeppelin raid over a portion of the London area which resulted in 2 women and 6 men (including one soldier) killed, and about 34 injured. The material damage done was small. The second announcement, timed at 5.25 p.m. the same day came from The War Office. This explained, “that a fleet of hostile airships visited the Eastern Counties and a portion of the London Area last night and dropped bombs.” Anti-aircraft guns were in action and five aeroplanes of the Royal flying Corps “went up.” Owing to atmospheric conditions no emgagement of the airships was possible. In total fifteen military personel were killed and thirteen wounded. A total of forty-one civilians (27 men; 9 women; 5 children) were killed and one hundred and one (64 men; 30 women; 7 children) were injured. Of these casualties 32 killed and 95 injured were in the London area. The events of the last few weeks, and especially the last few days, must have brought home even to the unreflecting the extreme seriuosness of the international situation, and the absolute necessity for being prepared to make very considerable sacrifices in order to ensure success. There is no need to exagerate the difficulties of the position, or to be panic striken in regard to it; but it is essential to recognise the need for sacrifice, and to consider it in all its varied bearings. The Hertfordshire Mercury on Saturday, 16th October did include short obituaries of three of the men who died outside Lombard House. These are reproduced here. The funerals were recorded the following week. DEATH OF MR. J.L. GREGORY – We have with regret to record the death of Mr. J.L. Gregory, Mus. Bac, F.R.C.O., and organist at All Saints’ Church. He was a native of Old Windsor and afterwards lived in Linconshire. About 1880 he came to Ware as organist of the Parish Church and a dozen years ago obtained the appointment at All Saints’. In the art of teaching he was a most genial and painstaking tutor and as conductor of East Herts Choral Society for the past quarter of a century he was beloved and respected by the whole of the music community for many miles around. He obtained very gratifying success with his choir in the great choral festivals at the Alexandra Palace and it is well known within the memory of our readers that he composed the music for the Hertford Pageant last year. Twelve or thirteen years ago he married Miss Roden, music mistress at Christ Hospital who, together with six young children has suffered a sad bereavement. The sympathy of the whole town and district will go to the widow, and her young family. Mr. Gregory was a prominent Freemason and had served the office of Worshipful Master of the local lodge. He was 55 years of age. The funeral takes place today. THE LATE BOROUGH SURVEYOR – Much regret is felt at the death of Mr. John Henry Jevons, Borough Surveyor of Hertford, at the age of 57 years. He leaves a widow and a son and daughter. He had been surveyor for the past twenty years, and proved a painstaking and faithful servant of the Town council. Mr. Jevons was a native of the Midlands and prior to coming to Hertford was surveyor at Braintree in Essex. Extra information: John Henry Jevons and his wife were both born in Staffordshire. They had two sons, John Henry and Cyril,18, and a daughter, Florence, 25. John Henry, Jnr had died in 1907 aged 18. DEATH OF WELL-KNOWN TRADESMAN – It is with regret that we have this week to record the death of a well-known tradesman in the person of Mr. Gregory Cartledge, draper, Fore Street, who was 56 years of age. 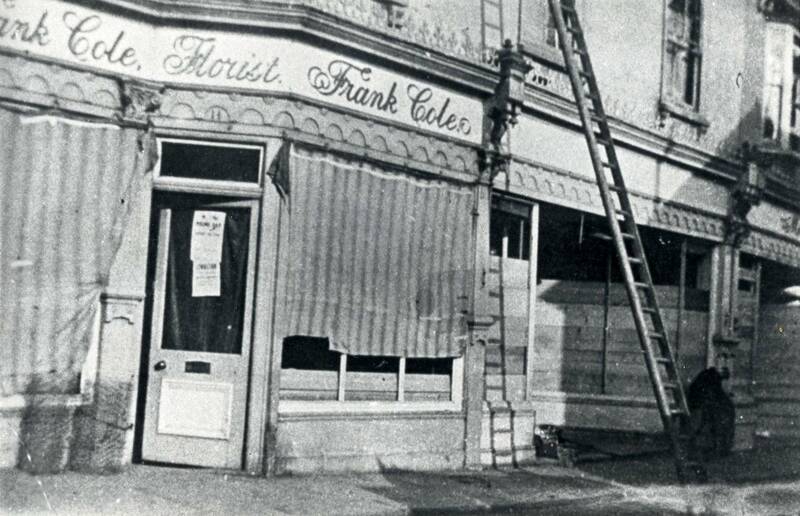 He had been in business in Hertford for nearly a quarter of a century and had been very successful. A man of a quiet and unostentatious disposition, he did not take a prominent part in public affairs, devoting the whole of his energies to the carrying on of his busines. He leaves a widow and two sons, one of whom is at the front with H.A.C. Extra information: George had been born in Alfreton in Derbyshire whilst Martha (nee Woodward), his wife, hailed from Pembroke Dock in South West Wales. They had two children, twin boys named Eric and Norman who were born on 19th December 1895 and so would be 19 in October, 1915. George had a drapery assistant, Beatrice Lintell, 39, who came from High Wycombe, Bucks. Martha probably died in 1927 in Chapel-en-le-Frith where she and Geroge had been married. Eric (Montague George) joined the 1st Reserve Battalion (Infantry Company), Honourable Artillary Company on 25th November, 1914. Norman (Edward Davies) married Barbara M Smith in 1926 in Marylebone. He died in Fakenham, Norfolk in 1982, aged 96. There was no obituary of Ernest Jolly but his funeral was recorded in the Mercury on Saturday, 23rd October. Funeral of Mr. E.T.Jolly. – The late Mr. E.T. Jolly, cashier at Messrs. Barclay’s Bank, Hertford, whose death occurred last week, was interred at Redbourne, his home, on Tuesday. The deceased was 27 years of age. Two wreaths were placed upon the coffin, one from the parents, bearing a card with the inscription, “Good-night, beloved boy, in God’s good care, through Jesus Christ, from Father and Mother,” and the other from the Rev. H.S.C. Whitehouse, vicar of St. Paul’s Walden, a friend of the deceased. Amongst the mourners were representatives from Barclay’s Bank and the Hertford Conservative Club and the Hertford Town C.C. Wreaths were sent by the ladies of the Hertford Tennis Club, from the bank staffs at Hertford and Hoddesdon, the members of the Hertford Cricket and Tennis Club, and the Conservative Club. Extra Information: According to the transcription of the death certificate Jolly was actually 29. He was the eighth of nine children born to Thomas (A farm manager) and Millicent Jolly and he was born in Withersfield, Suffolk. The Hertford Cricket and Tennis Club played both cricket and tennis at Balls Park before the war. After the war cricket continued at Balls Park but Sir George Faudel-Phillips refused permission for tennis to continue there. In 1920 the tennis club was set up in London Road. Of the remaining deaths Charles Waller’s was recorded in the Deaths column of the 23rd october edition of The Hertfordshire Mercury. No record exists of the others apart from on the War Memorial. Arthur was 21 when he died. He came from Yarmouth and was a bombardier in the Norfolk Regiment stationed in Hertford. George Game was three years old. Arthur Hart was 51 and a miller who was recorded as living with Frances, his wife, in Wellington Street in 1901. He was born in Walkern to Benjamin and Hannah Hart. Charles Spicer was 32 when he died. Charles Waller was 13 years old and lived in Hertingfordbury Road. Sir, Would not the present be an opportune time to take in hand the widening of Mill Bridge. I am aware that it would be difficult, and perhaps impossible to induce the Local Government Board to sanction a loan for the purpose until after the War is over; but is there anything to prevent the Corporation coming to a temporary arrangement with the adjoining property so as to facilitate the settlement of the question on some more suitable occasion? I suggest that the idea is one which all parties concerned might give their earnest consideration. of Nos. 20, 21, & 22 Lincoln’s Inn Fields, London WC. £2 per week payable during Temporary Total Disability, for a period not exceeding 13 Weeks.